The assemblage and disassemblage of sealing collars and groove sealing rings entail big requirements, also for experienced technicians. The following guidelines shall help to assemble a seal non-destructively and without big effort as well as assemble and disassemble the seal without damaging the metal components as far as possible. The most important matter is the intactness of the sealing collar after assembling. A failure of a sealing system is often caused by damages of the seals especially the sealing lips. 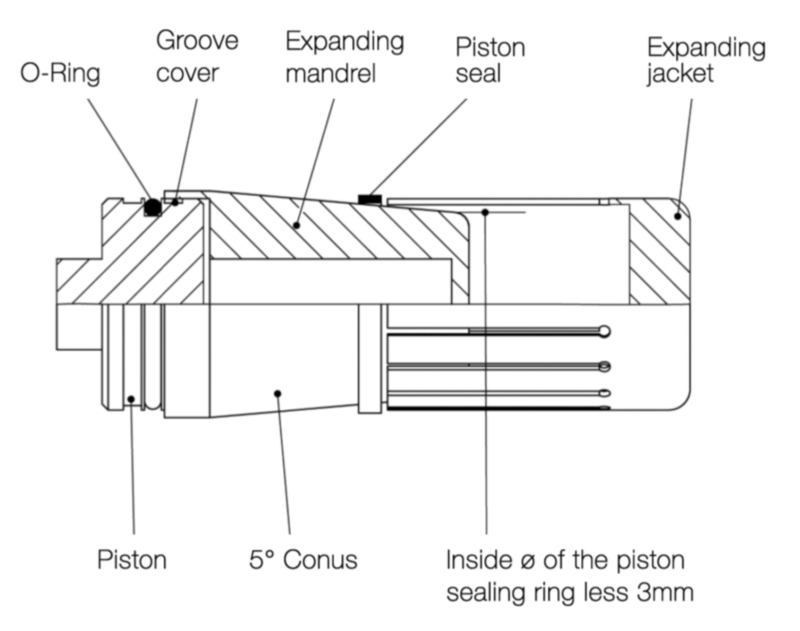 A piston seal is located on the piston and moves with it when processing. As a consequence the dynamic stressed sealing lip is located at the outer diameter. For this reason the relevant outer diameter [in mm] is normally named first when dealing with a piston seal. An oil bath is suitable for warming up seals. Always check the chemical resistance of the seal material against the oil. To improve the flexibility for assemblage it shall be heated up to a temperature of 60°C. Never surpass the maximum possible working temperature when warming up the seal. This can lead to no direct external changes, but an impairment of the mechanical characteristics. Please also abstain from on-the-point hea- tings (e.g. hot air showers or rather dryers). Annealing furnaces can be used for the warming process of the seal. 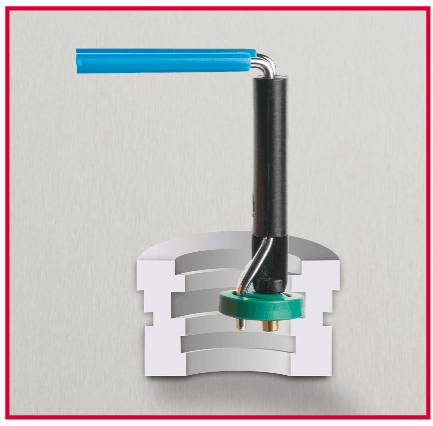 An axial face seal is a slide ring (see image 1 – “piston seal ring”) and an elastomeric preload element. Normally the preload is generated by an O-ring, in special cases also by a rectangular ring. The fitting areas have to be cleaned accurately and deburred if necessa- ry. Make sure lead-in chamfers at the cylinder liner and the pistons are present. If there are no lead-in chamfers present, the assemblage or rat- her the insertion of the piston and the piston rod including the seal requi- res increased diligence. With a simple lead-in chamfer like it is shown in image 2, there is a danger of tilting or shearing for the seal. 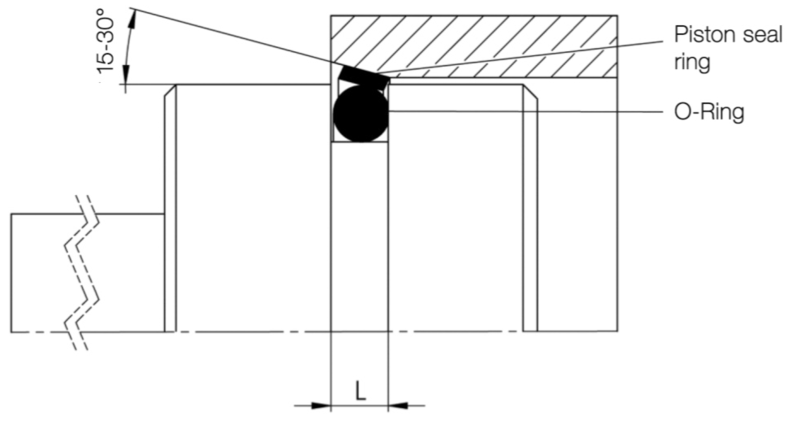 Our recom- mendations for the design of a lead-in chamfer can be found in the con- struction information (Construction information chapter 4 “Lead-in Cham- fers”). The first step is to place the O-ring or rather the preload element into the groove. Pay attention to not damage it when overrun other grooves. For this purpose a so called expanding mandrel (see image 3) can be used. 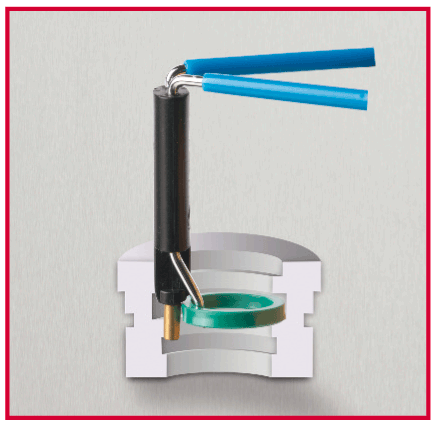 The real purpose of such an expanding mandrel is the assemblage of the PTFE piston seal ring. 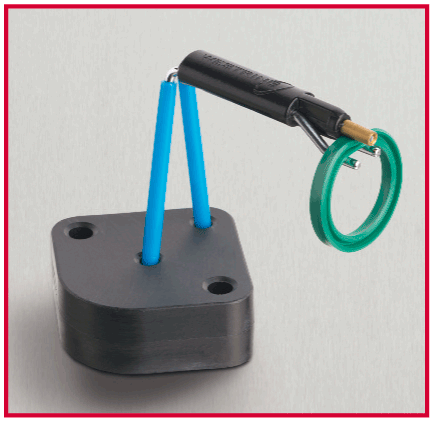 Piston seal rings with a diameter up to 100 mm and wall thickness of over 1,6 mm shall be mounted with this kind of assemblage tool in any case (see image 3). Attention must be paid to a slow expansion and assem- blage. As described in point 1, also PTFE piston seal rings get warmed up for a better flexibility with hot air or in an oil bath with 60°C. If the diameter is the same or greater than 100 mm an expansion with hands is possible. An unsteady and exaggerated expansion has to be avoided here, too. In case of a renunciation of an expanding mandrel, guiding ring grooves shall be covered with thin steel or plastic tapes. 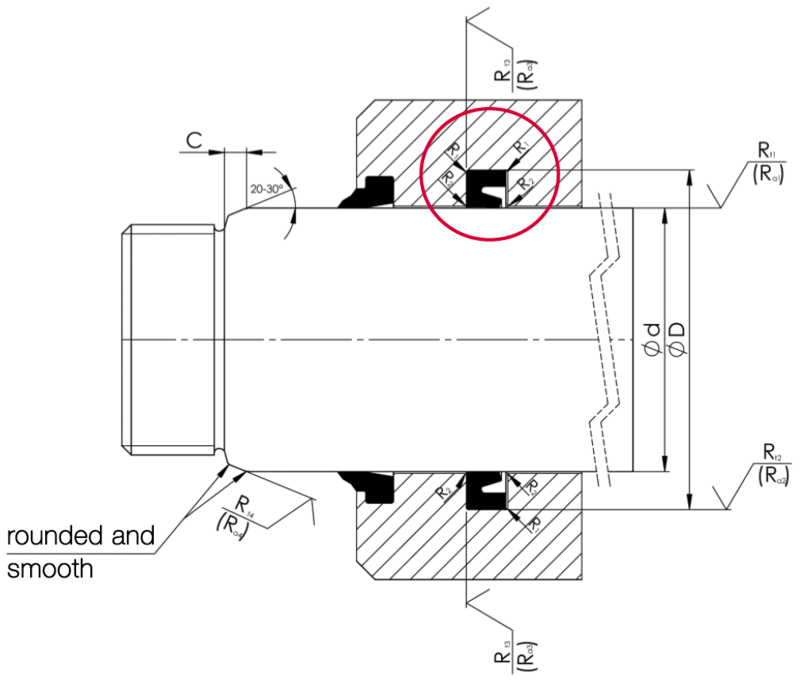 When using an expanding mandrel, the guiding ring grooves are covered by it (see image 3). The expanding mandrel ends directly behind the groove that is supposed to be bridged over. The PTFE piston seal ring has no opportunity to dive in anot- her groove. 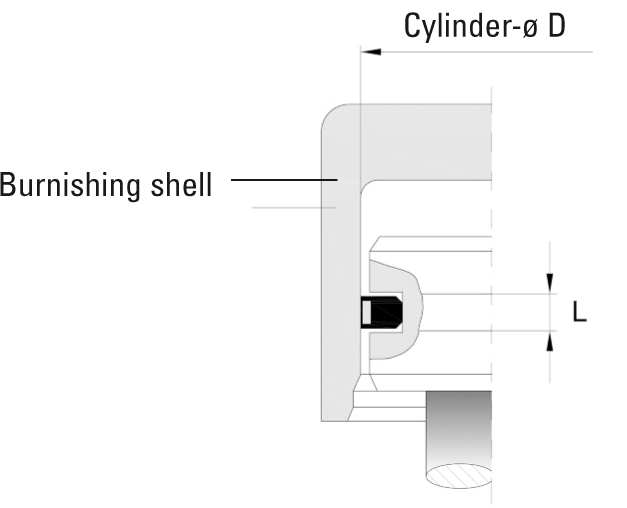 It is recommended to use a burnishing shell (see image 4) when the assem- blage of the piston is difficult as a result of big expansion of the piston seal ring or insufficient lead-in chamfers. This burnishing shell only serves the purpose to return the PTFE ring into its original condition. 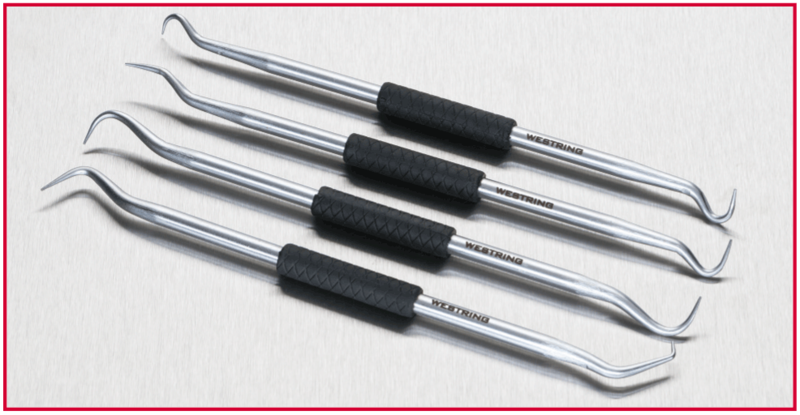 The assembling tools have to be expediently manufactured made of metal. In many cases a construction made of polyamide is satisfactory. If the technical application allows, we recommend our special silicone grease for easier installation or initial lubrication. 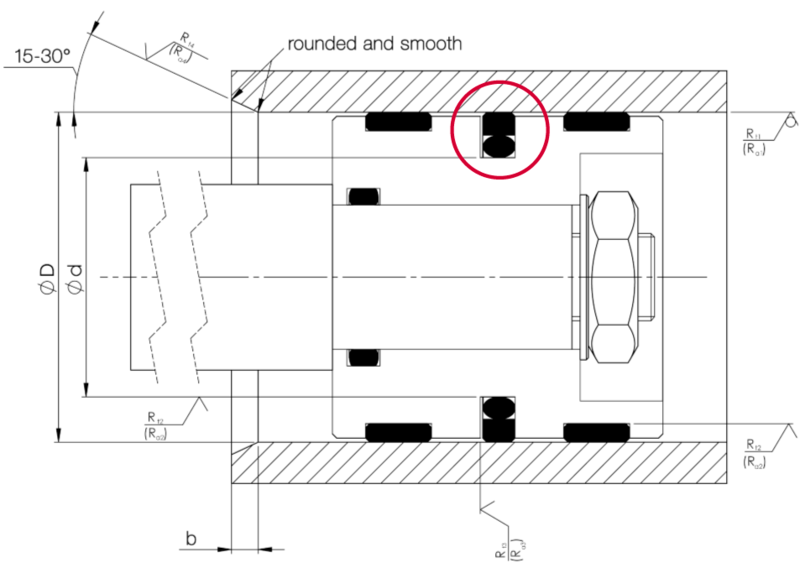 A rod seal’s (red marked in the following image 5) location is the housing and it doesn’t move in axial direction when the rod proceeds. The rod is in constant contact to the inner dynamic stressed sealing lip. For this reason the relevant inner diameter [in mm] of a rod seal is normally named first. This can lead to no direct external changes, but an impairment of the mechanical characteristics. Please also abstain from on-the-point heatings (e.g. hot air showers or rather dryers). Annealing furnaces can be used for the warming process of the seal. The aim is to easily assemble the seal which is implemented by a careful deforming. The shape should look a kidney as you can also see on the image 6. Alternatively, our assembling tools which have been especially developed for this purpose, are suitable within diameters of about 22 and 165 mm. Please observe the radial cross section when using the assemb- ling pliers. 3. Hold the handles of the tong with the grounded seal and place it in the designated installation groove. 2. Now pan the handles of the tong around the seal, so it is shaped like a kidney. Guide the seal, so it doesn’t slip off or drill. 4. Pan back the handles in the original position and let the seal dive into its groove. ting life of the seal. This leads once again to a repair in combination with high costs. The costs for correct exchange of the sealing components are low in comparison to processing the metallic components by a specialist. The disassemblage of piston seals requires manual dexterity in combina- tion with a considerable amount of effort in most cases. The tools for the disassemblage of piston seals can be purchased from us. We recommend the four part assembling needle set which is primarily used for O-Rings, but also very helpful in this case. It is recommended to spear the piston seal with the needles when a lip seal is used. The seal can be speared lip or dorsal sided. The groove ground as well as the piston must not be damaged under any circumstan- ces. After spearing the lip seal, pull it out of the groove to the radial cen- ter. Next, you have to slide an appropriate, non-sharp-edged holding spa- tula or pin (e.g. made of brass) between seal and groove, so the seal can’t dive back into the groove. The following removal of the gasket shouldn’t cause any more problems. In the case of a mechanical face seal, the slot screwdriver is the more appropriate tool to lever the slide ring element out of the groove. Also here it is necessary to pay special attention to the metallic edges and surfaces. 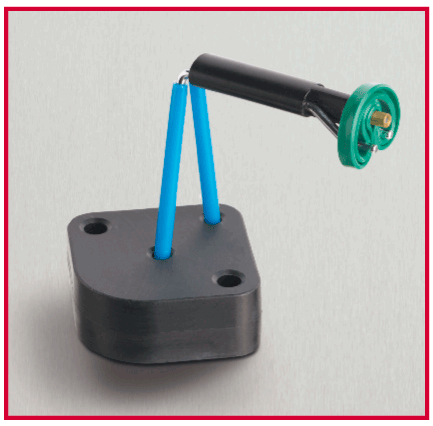 The preload element (O-Ring or rectangle ring) can be removed with the assemblage needles. The disassemblage of rod seals is a little bit more complicated because the seal which has to be removed is located in the housing of the cylinder. The seal can’t be reached easily, if the dimensions are small. 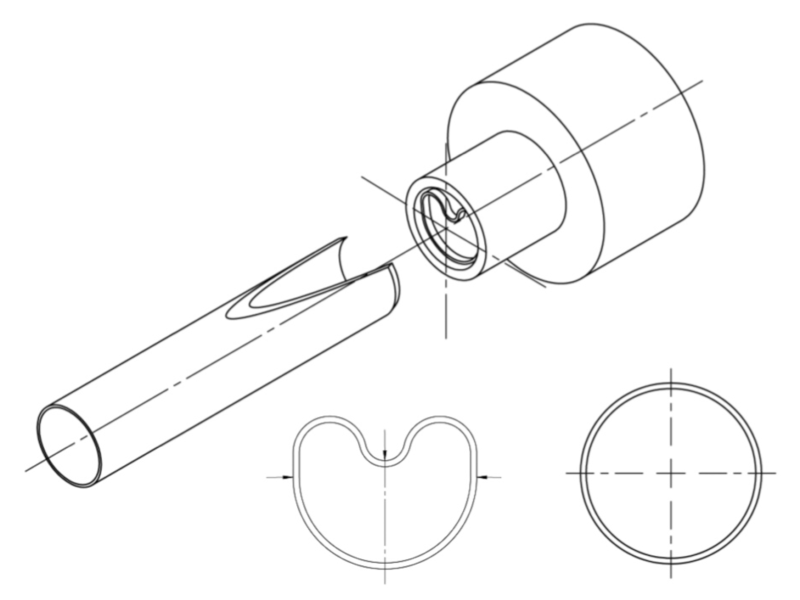 To remove a lip seal it is necessary to spear it with a pointed object or screw driver and pull it to the radial center. Afterwards it is advisable to slide an appropria- te, non-sharp-edged holding spatula or pin (e.g. made of brass) between seal and groove to not let the seal dive back into the groove. If a mechanical slide ring seal has to be removed, please be as careful as outlined in topic “DISASSEMBLAGE OF PISTON SEALS”. For further questions or special assembly situation please get in contact with our application engineers.